The kind of adaptations needed in the home will partly depend on the kind of disability a child has, the severity of the disability, and the age and size of the child. Adaptations for a child who is blind are very different than those for a child who is paralyzed and uses a wheelchair. A child who is completely dependent will need aids and adaptations to help the family care for him and move him -especially as he gets older and heavier. However, the disabled child who can do a lot for herself may be helped by adaptations that make self-care and work in the house easier. A simple ramp may work well for a wheelchair entrance to a house near ground level. A system of ropes and pulleys may be the best way for a person with strong arms to lift herself without help to a 'house on stilts'. The 'lift' can be made with a platform so that the whole wheelchair can be lifted. But if the house is small and people cook and eat at floor level, it may be best to leave the wheelchair outside. These can be fixed to the walls and furniture. If necessary, pathways with rails can be put up so that the child can walk with support almost anywhere in the house, and also outside to the latrine (toilet) or garden (see Page 507). Before attaching handrails firmly, test the child with a temporary rail at different heights to find out what works best. As the child grows, you may need to place the rails higher. Or you may want to remove rails little by little to help the child improve her balance and walk more independently. For the child who only rolls or crawls, some kind of straw mat or rug will help protect her knees and skin, and will help her stay cleaner (if floors are of dirt). For almost any disabled person - but especially those who use wheelboards or scooters with small wheels, the floor should be as smooth and firm as possible (but not slick or slippery). Packed, smoothed clay-and-cow-dung surfaces (as used in India) work well. Cement is even better for long-lasting use of a trolley or wheelchair. Although expensive, a smooth cement floor makes getting around a lot easier. Make all doorways extra wide. Remember, your child will grow and may need a bigger, wider wheelchair. In a house that already has very narrow doorways, be sure the wheelchair you buy or make is narrow enough to fit through easily. Most commercial chairs are much wider than necessary, especially for a child. 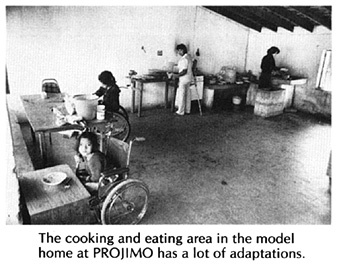 The stove, work areas, and tables should be as low as possible, but high enough so that the legs of the wheelchair rider can fit under them. CAUTION: If the wheelchair has high fixed armrests, the tables and oven will have to be higher. Or the wheelchair will have to approach from the side, in which case the table should be lower. The bed or cot should be the same height as the wheelchair for easier transfer. IMPORTANT: Before building fixed-height stoves, tables, and wash areas, set up something temporary to figure out what works best. Remember that the child is growing, so try not to make things too fixed or permanent. 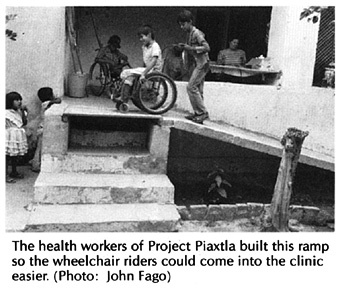 In many villages, disabled persons have a hard time going places because streets or paths are rough, rocky, or sandy. Also, there may be high steps for getting into stores, the cinema, and even the town meeting hall, school, and health center. 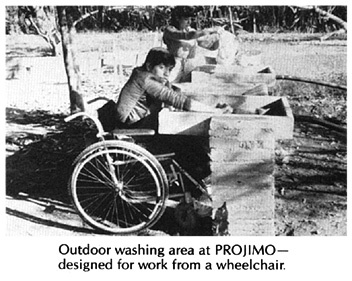 A village rehabilitation program can encourage the villagers to make it easier for disabled persons to go places and to participate in community activities. 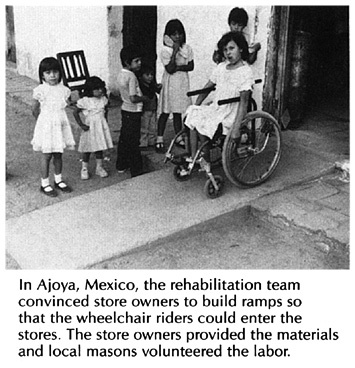 For example, ask storekeepers to build ramps so that wheelchairs can enter their stores. Disabled persons and their families can promise to give their business to those who cooperate in this way, and if necessary, can boycott (refuse to buy from) those who do not. The more gentle the slope of the ramp, the easier it is for a wheelchair rider to go up it. One or more ramps can be put parallel to the edge of the raised area. Be sure to leave large level platforms for turning. Addition of handrails will add safety and make going up ramps easier for persons who walk with difficulty. 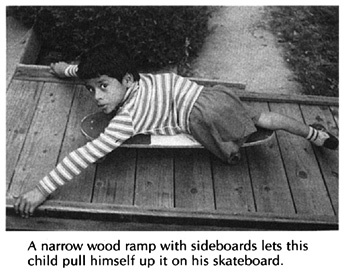 HOW STEEP YOU MAKE THE RAMP DEPENDS IN PART ON WHO IT IS FOR. Only possible with electric wheelchair or with help. Rarely possible for rider alone. Chair may tip backwards. Possible for average riders and strong quadriplegics. This is the best slope for public buildings and rehabilitation centers. Community work parties or groups of schoolchildren can organize to help fix up smooth, hard-packed pathways through the village so that crutch users and wheelchair riders can go places more easily. Also, if possible, easy-to-use pathways can be set up so that disabled children and adults can get to play areas, bathing areas, and family work areas. When placed along steep trails, these may permit children who are blind, who have balance problems, or who have difficulty walking to reach areas such as swimming or fishing holes. In one village a rehabilitation team together with some of the village children improved the steep trail down to the river, so that disabled children would have a chance to play and swim.